Kirk Douglas celebrates 101st birthday with son Michael and family: Pics! Kirk Douglas spent his latest birthday surrounded by the people he loves. 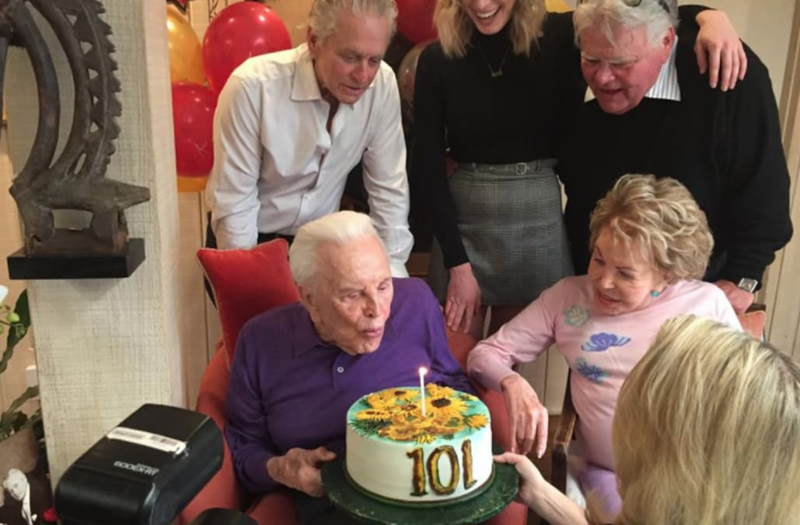 The legendary actor turned 101 years old on Saturday, and on Monday, actor Michael Douglas -- one of Kirk's three living sons -- shared photos from their family celebration on Facebook. Kirk enjoyed a sunflower-themed birthday cake, as his wife, Anne Buydens, sat beside him. Kirk's son, producer Joel Douglas, was also present for the festivities, as was his granddaughter from son Peter, Kelsey Douglas. "My brother Joel and I attend a family celebration for Kirk's 101st birthday on Saturday," Michael captioned the heartwarming post. "At 101 Dad is a true amazement and a great time was had by all." Michael explained that the family celebrated Kirk's birthday by honoring some of the actor's greatest performances. For example, the sunflower cake was a tribute to his performance as Vincent Van Gogh in 1946's Lust for Life. A pair of boxing gloves from Kirk's first Academy Award nominated performance in 1949's Champion was also displayed. Michael's wife, actress Catherine Zeta-Jones, also paid tribute to her father-in-law over the weekend with a sweet Instagram post calling him her "hero." "101 today!!!! My darling Pappy on my knee," she wrote. "Happy Birthday to my wonderful, inspirational and loving father in law, Kirk. Love you with all my heart. ❤️#hero." ET spoke with Michael and Catherine last month, when they revealed the secret to their long-lasting marriage. "I think understanding, listening, being friends, all helps," Catherine shared. "It's been a great 17 years." Kirk Douglas is embraced by his wife, Anne, in his dressing room after his opening performance in One Flew Over the Cuckoo's Nest at the Cort Theater November 13th. Douglas returned to Broadway stage after 17 years of movie stardom. Anne & Kirk Douglas at the Hollywood Foreign Press Association Luncheon to benefit Hollywood non-profit organizations and film schools, held at the Beverly Hills Hotel on Monday, August 19, 2002. (Photo by Kevin Winter/Getty Images).